Cardinal Health Triflex® latex surgical gloves offer excellent tactile sensitivity and an antislip finish for a firm grip. They feature a patented natural anatomical design that reduces thumb and palm strain for greater comfort. These gloves meet or exceed ASTM thickness requirements and have a mechanically locking cuff to prevent rolldown. 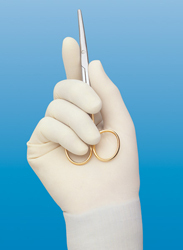 Gloves have a 12" average length and 9.1-mil average finger thickness. Supplied in easy-to-store pack.